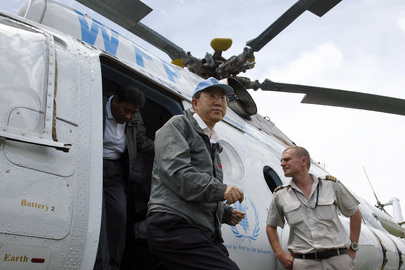 In Cote d'Ivoire, As UN Speaks Again of Gbagbo Helicopter, No Fly Zone? UNITED NATIONS, March 22 -- Has the UN Mission in Cote d'Ivoire declared a no fly zone over Abidjan? After bringing in attack helicopters from Ukraine, and accusing defiant leader Laurent Gbagbo of trying to bring in attack helicopters from Belarus, the UNOCI Mission has now accused Gbagbo of “repairing” an MI-24 helicopter, and has warned it should not be used. 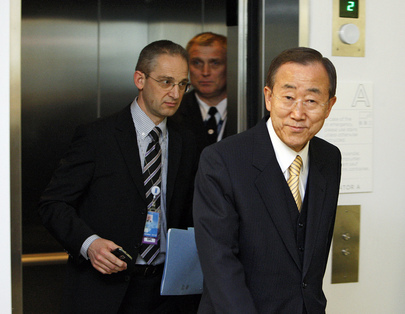 The pro-Gbagbo forces see this has just another example of the UN taking sides. The pro-Ouattara force, including his diplomats at the UN whom Inner City Press has spoken with, see UNOCI's action as too little, too late. 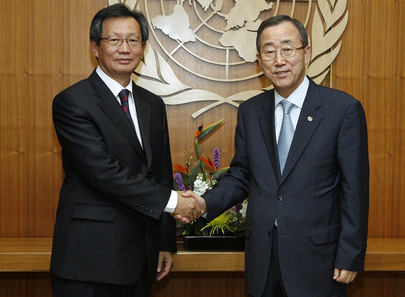 Ban Ki-moon's envoy Choi Young-jin is “sufficiently pro-Ouattara” for them, but they don't think the UN's military force commanders have done enough. Inner City Press: On Côte d’Ivoire, there is the mission there, UNOCI has apparently put out a statement saying that they believe that [Laurent] Gbagbo forces are, quote, repairing an MI-24 attack helicopter, and that any attempt to use this will not be allowed, or not be accepted... is it illegal for them to fly a helicopter? What exactly is the mission’s statement? Where did this helicopter come from, given the past statement that they were coming in from Belarus? And is there a no-fly zone in essence over Côte d’Ivoire? How seriously do they take this and do they agree finally with Mr. [Alassane] Ouattara’s side who says that 832 people have been killed by the pro-Gbagbo forces since the beginning of this stand-off in the election? Spokesperson Martin Nesirky: A considerable number have certainly been killed, and I am sure that my colleagues who are carefully monitoring this in Côte d’Ivoire would be able to provide an update on figures. As you know, they have been… human rights colleagues, humanitarian colleagues who monitor this, have been fastidious in providing detailed figures. So, I would anticipate that we would be able to provide more. On the helicopter, its exact provenance, I would need to ascertain. I do not have that information. The mission in Côte d’Ivoire, as you know, has a Security Council mandate to protect civilians. And it will do all that it can within its mandate and with the resources it has to protect civilians in the country. Inner City Press: But what I couldn’t tell from the statement is whether they are saying to the Gbagbo forces “don’t fly the helicopter at all”, or “don’t use it to kill civilians”, which obviously is, I mean, what are they saying? What is their current status? What’s the, what message are they seeking to send with this statement? Spokesperson Nesirky: The message is that the mission is there to protect civilians in the country. And that it is doing under a very clear mandate from the Security Council. Inner City Press: Do you remember this previous question about there was a particular, you know, killing of civilians that was attributed to the pro-Ouattara side by Human Rights Watch and others? And you, I mean, I don’t mean to… has UNOCI actually, did they report that in real time or have they said anything on that? I know that they are very fastidious, but on that one, I still haven’t heard anything back to show that they reported that as equally as they do the other side. Spokesperson Nesirky: We’ve consistently said and the Office for the High Commissioner for Human Rights has also been quite clear on this. Any human rights abuses on either side would need investigating and should be condemned. And if I have any further information on that I would let you know. And eight hours later and counting, there was no further information. Watch this site.